Fleetwood halted a run of three defeats in Lancashire/Cheshire Division One with this impressive six-try victory over the bottom club. Gavin Rowell scored 18 points for the hosts from a try and six goals. Fleetwood applied early pressure as James Lilley burst through for a try followed Rowell’s first goal. Hoylake got off the mark with a penalty but Fleet retained their momentum, good turnovers resulting in their second try by Jamie Moran, Rowell’s conversion making it 14-3. 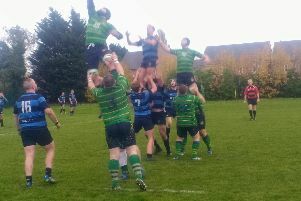 The visitors broke through the defence for a try. The conversion was missed and Rowell’s penalty stretched the lead to 17-8 at half-time. Hoylake started the second half strongly, scoring from a tap penalty, and although the goal was missed Fleet’s lead was down to four. However, they proceeded to pull clear with three tries, Devon Brown scoring the first of them by finishing Karl Bowling’s break. Rowell scored next himself before Brown’s interception try secured his double and the man of the match award. All three tries were converted by Rowell for a commanding 38-13 lead. Hoylake refused to surrender, two unconverted tries closing the gap to 38-23. But Fleet weren’t finished yet, creating an overlap for Brad Stapleton to complete their scoring with the only home try which went unconverted. 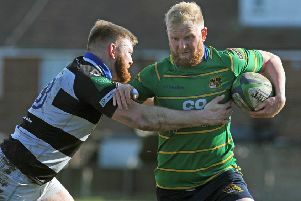 Hoylake had the final say with a try following a series of penalties, though 10th-placed Fleet’s season was back on track ahead of Saturday’s testing visit to second-placed Bowden.